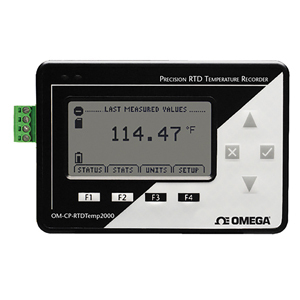 The OM-CP-RTDTEMP2000 is a battery powered precision RTD temperature recorder, with a LCD display. It is perfect for applications requiring precise temperature readings. The 8-button keypad and large LCD provide convenient access to current data and recorder setup. Additionally, memory and battery levels, external power status, and sampling and recording status are shown on the LCD. Available on-screen data includes: statistics (min, max, average); recording status (start, stop and recording rate); display options (units, text size); and calibration information (date calibrated, date for recalibration). Statistics can be cleared at any time during logging. With 174,762 readings, the OM-CP-RTDTEMP2000 has one of the largest memory capacities of any similar data recorder on the market. The non-volatile memory will retain recorded data, even if AC and battery power are lost. The OM-CP-RTDTEMP2000 runs on a 9 V battery with a typical battery life of 1 year at a 1 min reading rate with the display off. With continuous LCD and no backlight usage, the average battery life is 30 days. For power savings, both the LCD and backlight have configurable auto-off options. Those wanting to keep the LCD display and backlight continuously active need only to connect the unit to an AC power supply, keeping the 9 V battery connected as a back-up. NIST traceable calibration is available for users needing to meet regulatory requirements. Creating permanent records, performing data calculations, and the graphing of data is quick and easy: Simply connect the interface cable to an available USB or serial port and, with a few clicks of the mouse, data is downloaded and ready for review or export to Excel. off. 30 days typical with continuous LCD and no backlight usage. 참고: Comes with operator’s manual and 9V lithium battery. Battery cannot be purchased separately.